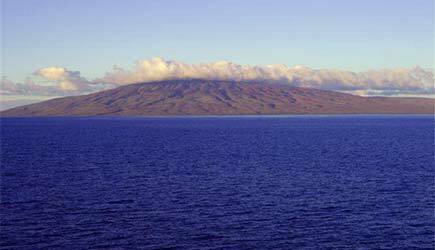 Nine miles across the Au'au channel from West Maui lies the privately-owned island of Lanai. It was once the largest pineapple plantation in the world; now very little pineapple is grown there. The island's economy is centered around the two resort hotels - the Manele Bay Hotel and the Lodge at Ko'ele. Most visitors to the island come over for the day from the island of Maui. The island is very dry and doesn't have the lush beauty found in Maui's rainforests, but Lanai has the longest stretch of coral reef in Hawaii and the beaches on this island are down right deserted. The area around the Manele Bay hotel is particularly beautiful, with uncrowded beaches, fascinating tidepools, great snorkeling, red seacliffs, and lots of sun. 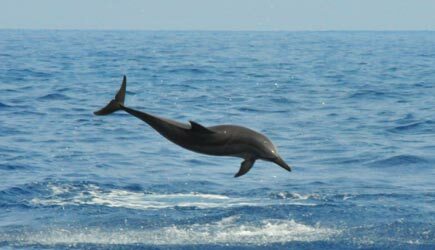 But the biggest attraction of Lanai is the large pod of Spinner Dolphins frequently encountered on Lanai's southern coast ... watching these marine mammals in their natural environment will surely be one of your most memorable vacation highlights! What a great trip! 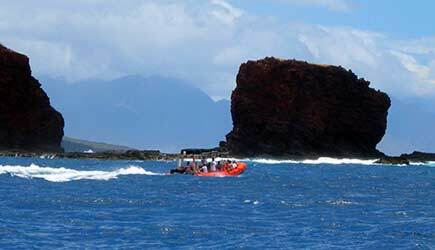 As your raft crosses the Au'au Channel on the way to Lanai the search for dolphins begins. 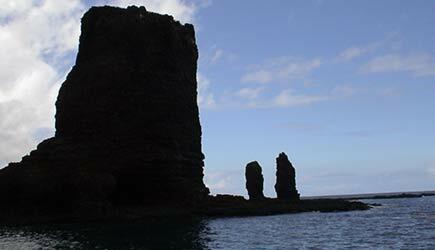 When you arrive at the island of Lanai the captain will select an excellent spot to snorkel from the boat. 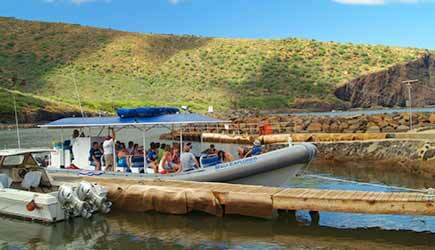 After snorkeling, the Lanai Explorer lands at Manele Bay Harbor. 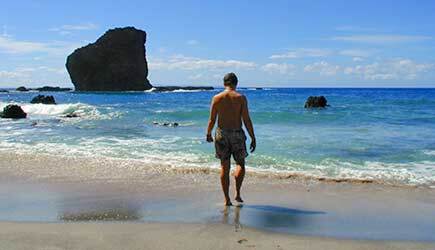 You get to spend three hours on the island of Lanai, exploring some fabulous isolated beaches that are a 7-10 minute walk away. More great snorkeling is available at the beach, and don't miss the fascinating tide pools found nearby (see the amazing photos above). This 6.5 hour trip is perfect for people who want to go on a snorkel trip to Lanai, but who don't want to spend the entire time on the boat. During the three hours on the island you are on your own and free to go off and explore. Hike the trail to the spectacular Sweetheart Rock overlook. 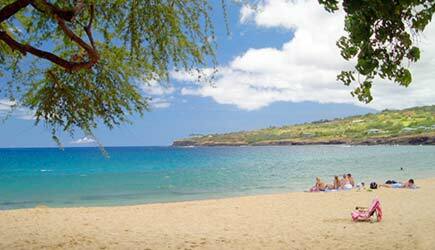 Relax at breathtaking Hulopo'e Beach. You can even walk up to the luxurous Manele Bay Hotel and stroll the grounds or enjoy a cocktail at their poolside bar. This tour includes snorkel gear, and a personal-sized cooler with a deli lunch and beverages that you take with you to the beach. The Lanai Explorer is fast, fun, and comfortable with a maximum capacity of 35. The Lanai Explorer with Landing tour is offered on Mondays, Wednesday, and Fridays ... check in is at Lahaina Harbor at 9:00am and the tour is from 9:30am to 4:00pm. This tour is operated on the same boats that do the Lanai Landing, but with a shorter itinerary. 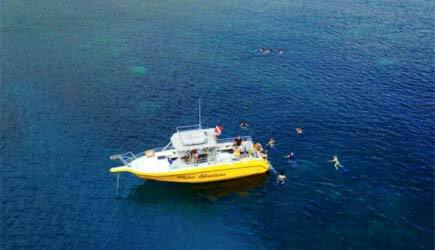 Instead of stopping at Manele Harbor and giving you three hours to explore the island of Lanai, the boat goes to a second snorkel location for an additional hour of snorkeling. The tour includes snorkel gear, two snorkel sites from the boat with a total snorkel time of a little over two hours, breakfast, a deli lunch, and dolphin watching ... all in a 4.5 hour trip. While the overall tour length is shorter than the landing version, the non-landing tour does have more time on the water and this increases the opportunities for encountering dolphins! The Lanai Explorer Dolphin (no landing) tour is available on Tuesdays, Thursdays, and Saturdays ... check in is at Lahaina Harbor at 7:00am and the tour is from 7:30am to 12:00pm. Note: Lanai Explorer has a $6 per seat fuel surcharge for adults and children on all of their tours which will be added to the above rates. Not recommended for anyone with neck or back injuries or pregnant women. Minimum age for these tours is 5. 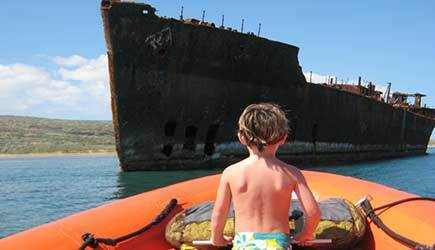 Exceptions may be made for kids who are 4 years old and particularly adventurous and are good swimmers. Vegetarian lunches are available by request ... if you would like a vegetarian lunch please call our office after making your reservation using the form on the right. This is a WHALE of a combo deal! If you are coming during humpback whale season (December through April) reserve either of the Lanai Explorer snorkel tours listed above and receive an adult rate of $34pp on one of the Whale Express whale watches (normal list price is $49). CLICK HERE FOR MORE INFORMATION OR TO RESERVE THIS COMBO. 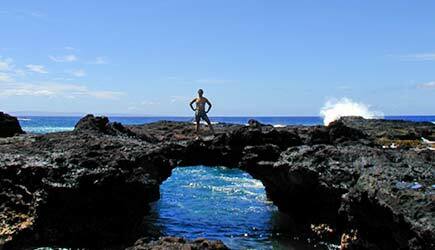 Jump into the pristine waters of Lana'i! 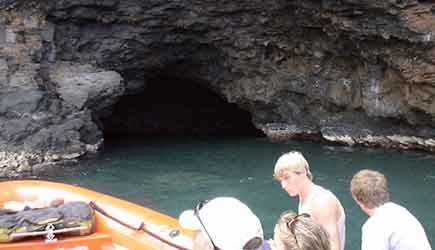 Escape the crowds of Lahaina and explore the pristine waters of Lana'i with Makai Adventures! This 6 hour tour is offered April through November on Monday, Wednesday, and Friday from 7:30am - 1:30pm. Their boat, Kainalu, is a comfortable and spacious small boat that features easy ocean access with a large swim step, dual swim stairs, cushioned seats, on-board restroom, freshwater shower, dry storage, flotation gear, and 50/50 shaded seating. You will depart from Lahaina Harbor, Slip 16. Makai adventures provides you with the top of the line Cressi brand snorkeling gear and fins ensuring the most comfortable snorkeling experience. They also have extension poles for gopro cameras if you need one! Cruise across the 'Au'Au Channel to the island of Lana'i, and sit back and enjoy while their Captain points out sites along the way. Lana'i is home to remote coastlines with sea caves, miles of sea cliffs, blowholes, sea caves and arches, King Kamehameha The Great's favorite fishing grounds, ancient Hawaiian burial sites, and many of Hawaii's best coral reefs. You will stop at the Captain's choice of the best 2-3 snorkel sites based on the day's conditions making each trip unique. Above the water, keep an eye out for humpback whales and dolphins. 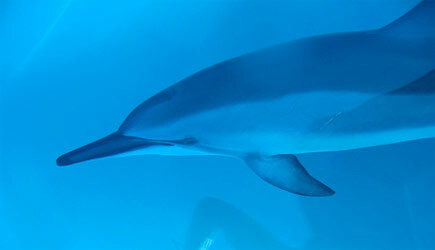 Watch Lanai's resident pod of dolphins ride the bow wave and do acrobatic tricks. 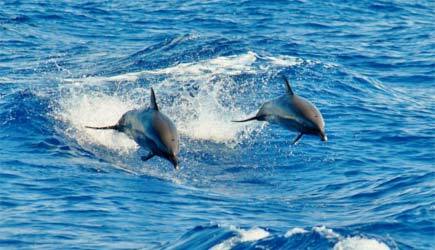 You may see Spinner dolphins, Bottlenose dolphins, or the elusive spotted dolphins! 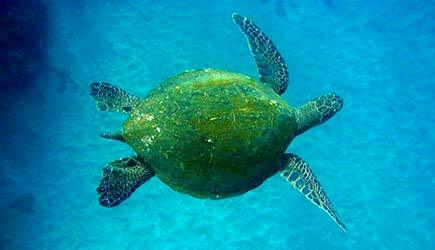 Under the surface, swim with turtles, schools of fish, and colorful coral. Before heading back to Lahaina and anchored in a remote cove, you will be served a deli "design your own" sandwich station with fresh cut fruits and veggies. Soft drinks and ice cold water, and you are welcome to bring own alcoholic drinks for after snorkeling. To keep plastic out of our oceans, they provide a 5-gallon jug of ice cold water for you to refill your reusable water bottles or use the provided paper cups. They recommend wearing your swimsuit, and bringing a towel, sunscreen (no spray sunscreen), hat, sunglasses, camera, reusable water bottle and a light jacket or sweater. You can also bring a wetsuit top or sun protective clothing. 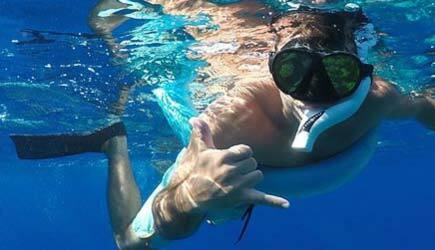 If you need a speciality mask such as a prescription mask, rent one at a snorkel shops before your trip. The minimum age for this tour is 3, and it is not suitable for anyone with back or neck injuries or problems, or for pregnant women. An exhilirating sail to the exclusive island of Lanai! Relax in one of the tidepools! 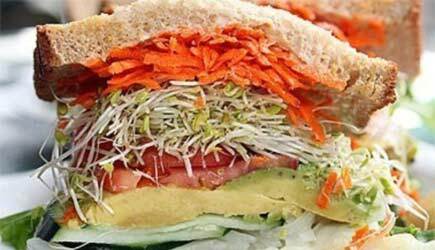 Delicious fresh sandwiches for lunch! 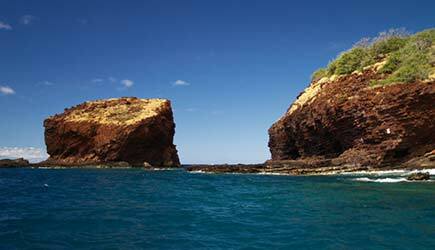 Lanai is one of the top snorkel destinations in the world! 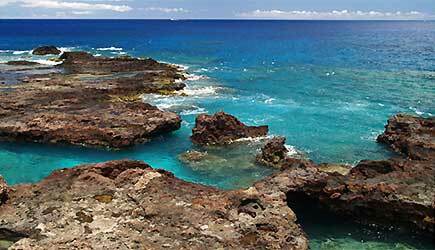 Explore one of the most beautiful Hawaiian islands! Paragon will take you on a thrilling ride! 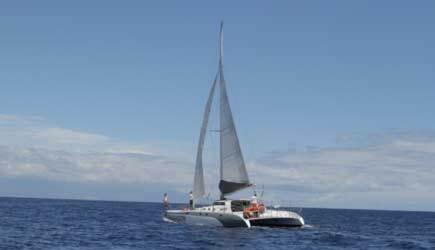 Paragon sailing has added a brand new vessel to their fleet! 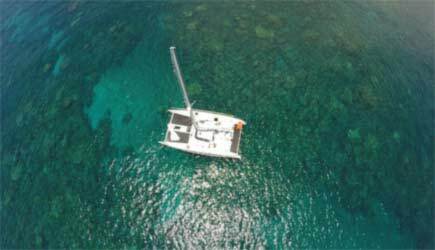 The Alihilani is a 49 passenger performance sailing catamaran with ample power to motor as well, giving more beach time on the island of Lanai. This new vessel does not yet have a liquor license, so they cannot serve beer, wine, or mai tais, but you are welcome to bring your own alcoholic beverages with you. (No GLASS containers and no RED wine please.) The introductory rate for this cruise has dropped $20 per adult and $10 per child off their previous cost for this tour. 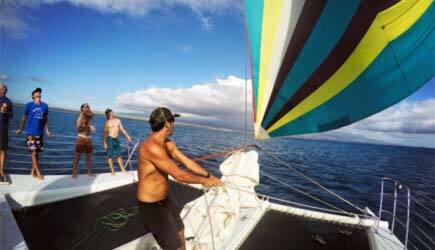 For the leading sailing catamaran on Maui, look no further than Pargaon Sail. 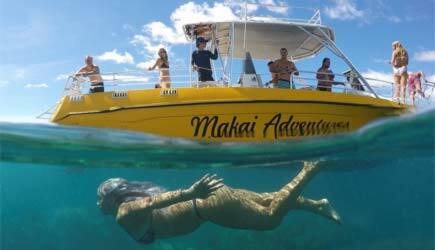 They combine a thrilling sailing adventure with world class snorkeling. Paragon Sail has been dedicated to serving Maui visitors and locals for over 20 years, and their experienced and friendly crew create a personalized adventure. They specialize in performance sailing, and you will enjoy trade winds as you glide along ocean to the exclusive island of Lana'i. This top 10 snorkel destination features tide pools, pristine reefs, tropical beaches, and spinner dolphins that play in Manele Bay. This 7 hour tour is offered daily except Saturday & Sunday at 8:30am to 4:00pm. Check in is at 8:15 a.m. at Lahaina Harbor. You begin your adventure sailing across the Au' au' channel to Lana'i. As you enjoy a continental breakfast, gaze upon views of Maui, Moloka'i, Kaho'olawe, and Lana'i. 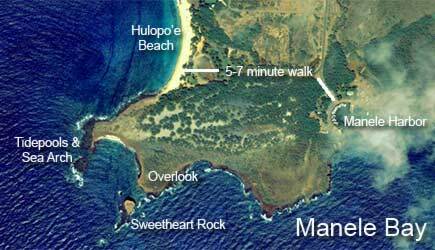 Manele Bay is your first stop, which is teeming with vibrant and healthy reef. When you arrive on Lana'i, stroll 10 minutes to one of the most stunning beaches in Hawaii, Hulopo'e beach. For your picnic lunch, feel free to choose a spot… under a palm tree on a grass mat, at a picnic table, or stretch out on the warm golden sand. 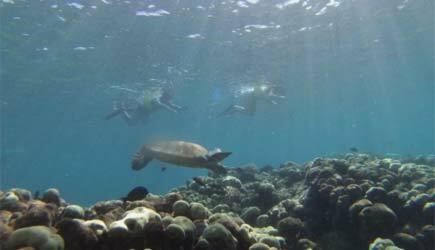 The reef is just as amazing here, so bring your snorkel gear with you! At the harbor area you have access to share picnic tables and facilities if you prefer not to walk to Hulopo'e beach. If conditions permit, there will be one last stop off the coast of Lahaina; here you can jump into the warm blue waters for a last dip to end your perfect Hawaiian day! For this tour, Paragon provides snorkel, and there are optical masks as well. Let us know if you require one. You can also bring your own snorkel gear. Spray-on sunscreen is not allowed aboard the vessel, because it has a tendency to go everywhere making it slippery and dangerous to move around the deck. 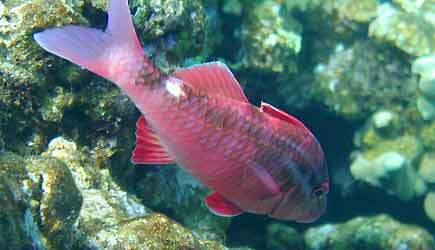 It is also generally toxic to the marine ecosystem. 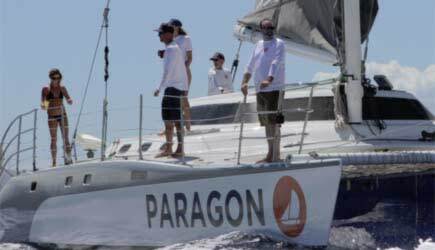 Paragon encourages using reef-safe sunscreen, which they provide on their catamarans. Also, bring a hat, camera, reusable water bottle, sunglasses, and towels. Paragon does not provide towels, but they have them available for purchase onboard. Note: Vegetarian or gluten free options are available, but those with severe nut allergies or celiac disease should be aware that the catering companies do not guarantee no cross contamination. Paragon will take infants under the age of 3, but we do not recommend it because of the amount of walking on this tour. If you do want to take infants, please go to our Paragon Sailing page to book your reservation. 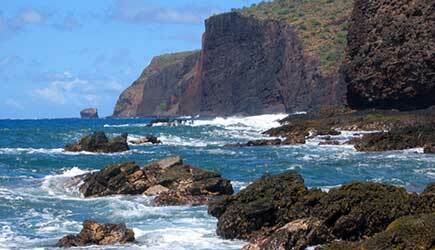 Lanai has miles of beaches with no one in sight anywhere! Ocean Riders has a 3% fuel surcharge which is added to the above rates. 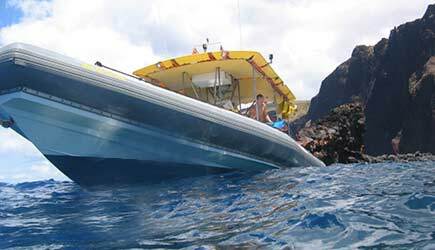 Ocean Riders is the ultimate Lanai adventure, completely circling the island in a zodiac raft. 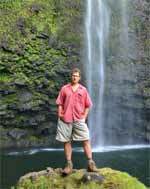 They are the only tour operator that consistently circumnavigates the entire island of Lanai year-round. 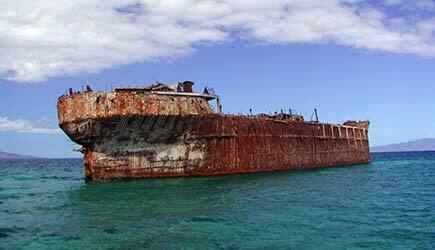 On a normal tour you will see shipwrecks strewn along the north shore of Lanai. They anchor in shallow water and you have the opportunity to swim in and walk around on an isolated, remote beach where there is no hotel or road in sight! Your captain will pull inside a sea cave carved out of the cliffs by giant storm swells over the centuries. 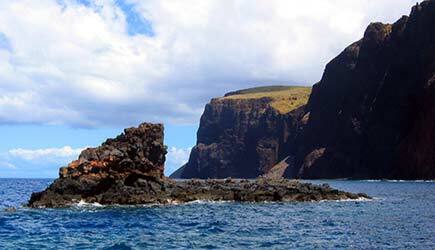 Witness the cliffs of the Kona Coast of Lanai ... and see Shark Fin, one of our favorite snorkel spots in Hawaii and one of the few places where pyramid butterfly fish can be seen. Ocean Riders zooms in and out of every nook and cranny of the coastline, sometimes at breathtaking speeds! Lanai has some unbelievable scenery and wild rock formations on the back side ... places that very few people who live in Hawaii have ever seen ... but with Ocean Riders you get to see it all! For thrill seekers, this is the trip for you! It also offers you the ultimate get-away adventure. 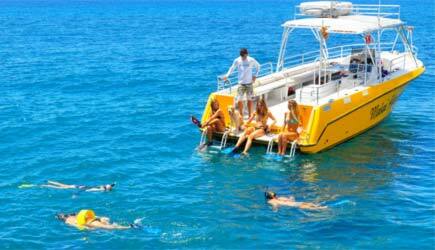 They are going to snorkel at places where other snorkel boats just don't go. On a normal day they will snorkel at three different spots ... sometimes four. And if there are dolphins anywhere along the route ... Ocean Riders will find them! 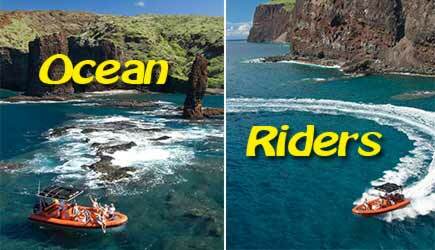 On very rare, EXTREMELY calm days Ocean Riders will set asisde their normal itinerary and head to the north shore of MOLOKAI ... where even more spectacular scenery than Lanai awaits. If you happen to catch them on one of these days, count yourself particularly blessed and make sure you have LOTS of room left on your digital camera's memory card! The setting on Molokai is truly stunning ... the tallest sea cliffs in the world tower overhead and sea caves and waterfalls await around each turn. Ocean Riders features a deep-V rigid hull inflatable raft that is 30 feet in length and capacity is limited to 18 guests per tour. 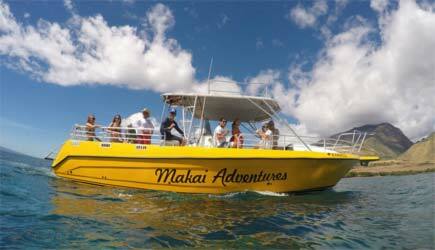 The boat is powered by twin 250hp engines ... this boat is truly the Ferrari of snorkel tours on Maui! Ocean Riders checks in at the Mala Boat Ramp just 1/2 mile north of downtown Lahaina (not Lahaina Harbor) ... check in is at 6:30am. The tour departs at 7:00am and returns between 2:00pm and 3:00pm (depending on ocean conditions). This trip is limited to 18 people per day ... children under 5 are not permitted. Rough ocean conditions are sometimes encountered. No one who is pregnant or has neck or back injuries is permitted. Sound like the sign posted at the entrance of a roller coaster??? Maybe a little ... but after all, this trip is the ADVENTURE of a lifetime. There are a few days per year that the winds don't permit going all the way around, but circling the island of Lanai (or going to the north shore of Molokai) is always their goal. NCL cruise ship passengers in Kahului are NOT able to do the Paragon Sailing or the Lanai Explorer with Landing tours because the tour length makes the arrival back to Lahaina too close to your cruise ship's departure. It IS possible to do the Makai Adventures Lanai tour on the second day in port (Monday) as the tour ends about 1:30pm and leaves ample time for the drive back to Kahaului. Transportation is not included, and is most economically done by renting a car. We can arrange a rental car with shuttle pick-up at the harbor; rates vary throughout the year but start around $40 per day in low season; see our rental car page for more information. Drive time is approx. 60 minutes to Lahaina. 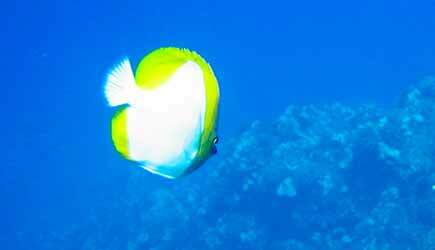 You might also consider a Molokini snorkel tour as those trips depart from Maalaea Harbor, which is just 15 minutes away from your cruise ship's dock. 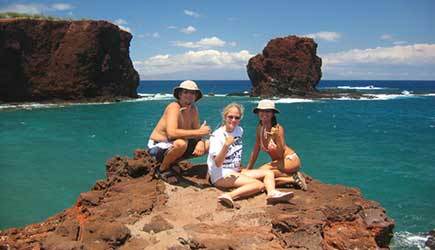 Lahaina cruise ship passengers can do any of these tours as long as you are in port on the correct day of the week. This tour leaves from the same harbor where your ship's tender arrives, so no transportation is necessary. 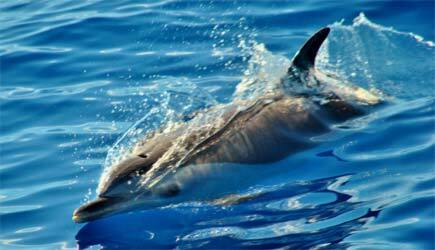 A Lanai dolphin adventure is a must-do on my list of Maui activities. 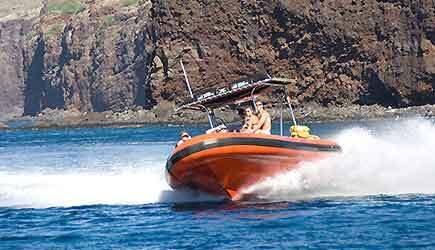 If you have time for two snorkel boat tours, go to Molokini and Lanai. If you only have time for one, go to Lanai!!! The reef there is just as good as Molokini (better in places) with lots of fish and turtles ... and there are a lot less people. Lots of people ask if they can swim with the dolphins. The honest answer is "probably not." 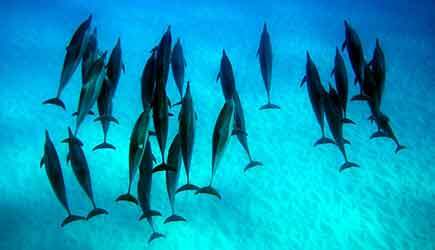 Snorkel tours have to be very cautious in approaching dolphins ... they are protected marine mammals. Once in a while a boat will stop to snorkel and the dolphins will approach out of curiosity. If this happens, enjoy the moment ... you are truly blessed. Don't plan on it happening. You will likely see plenty of activity just watching them from the boat ... the large pod of spinner dolphins at Lanai is very active. You will likely witness acrobatic behavior and dolphins will probably swim on both sides of the bow of the boat just a few feet away from you. The Lanai Explorer is our most popular tour .... it offers the adventure of rafting ... but more comfort than most rafts as there are real seats on board the vessel (you don't have to sit on the innertube sides of the raft unless you want to). 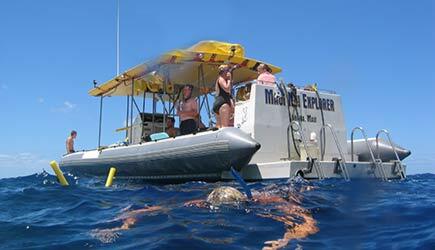 The Lanai Explorer also offers quite a bit of shade and has a marine head on board when nature calls. We absolutely LOVE the Lanai Explorer with Landing tour. Grab your camera and hit the trails that go out to the point beyond Hulopo'e Beach ... see the colorful tidepools and sea arch, scrample down a wooden ladder to the hidden beach that looks out to Sweetheart Rock (the Hawaiian placename is Pu'u Pehe), and hike up to the overlook. You can even walk up to the Manele Bay Hotel ... the place Bill Gates rented out entirely when he got married here on Lanai. This tour is doable for the majority of our clients ... but not all. Keep in mind that there is a walk of about 5-7 minutes each way to and from the beach. 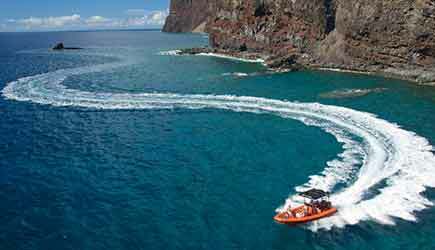 The non-landing version of the Lanai Explorer is a great choice for people who have been on-shore at Lanai before ... and want to spend more time out on the ocean around the island. Finally ... the trip for the die-hard adventurer. Ocean Riders is an awesome tour ... if you are up to the challenge. When you leave the harbor at 7:00am be aware that it will be 7 or 8 hours before you will see another white porcelein seat with chrome handle on the side of it. 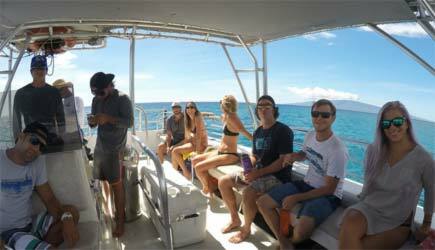 This tour can be rough at times ... but in terms of the amount and variety of snorkeling, the overall distance the tour covers, and the value you get for your dollar ... this is the best itinerary in Hawaii for those of you die hards out there! 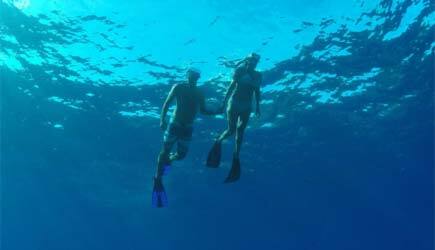 One more Lanai ocean adventure worth mentioning ... for CERTIFIED scuba divers, Extended Horizons operates an excellent scuba diving trip to Lanai ... they typically visit the spectacular underwater grottos called "Cathedrals" as well as one other site. 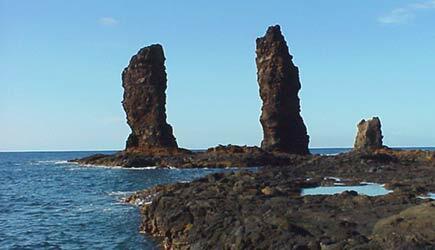 For more information about Lanai scuba diving see our Scuba Diving page.